Is there a legend for for France IGN Topo and Swiss Topo? Also, what do the purple vs. black (sometimes dotted) lines mean on the zoomed in level? Is thereby chance a way to differentiate a ski route from a hiking route? The trails highlights in purple are La Grande Ranfonnée long-distance trails that have been approved by the FFRandonnée. Hi I was curious what some of these symbols on Gaia GPS maps are? Someone already identified some above but not these. In Ryanlabruzzo's screenshot, what does the boulder-like icon on the far right mean (over the 3800' topo index)? And why don't you have a legend for the Gaia Topo Map? I looked through the resources at the beginning of this article and still don't have the answers I'm looking for. The legend should really be part of the map viewer from the beginning. I shouldn't have to go finding KB articles to understand the map I'm reading. The boulder icon represents a boulder field and we are still working on the legend for Gaia Topo. Once finished, it will be added to this article. In the meantime, if you have any questions on markings on the map, please click “Submit a Request” above to contact support directly and someone will get back to you shortly. We are looking into adding more map sources which will include big game winter and summer ranges. Unfortunately, the scaled quail habitat data is in WMS and Gaia GPS only supports TMS or WTMS files. Sorry about that. However, you can download the USGS's scaled quail range as a shapefile here: https://www.sciencebase.gov/catalog/item/59f5e299e4b063d5d307df8d. Then, follow these steps to import it as a custom map source through Mapbox Studio. What are the green/white and yellow/white dashed lines on MVUM mostly in Colorado and Utah? The green/white and the yellow/white dashed roads on the MVUM overlay are single track trails open to motorcycles only. Does Gaia Maps plan to integrate keys into the maps? Having to keep a downloded copy of this thred is not the best way to use a key. Also, individual maps via National Geographic seem to have variances which makes map reading difficult. Do you have a time estimate for when keys will be integrated? We are discussing how to surface the map legends in the app, however, I don't have an ETA for this right now. I am trying to find a legend for the "Roads and Trails USFS" layer. I can only find information on the MVUM layer. I would like to know what the different colors represent. The Roads & Trails (USFS) overlay is colored coded by the road/trail classification level and I have updated this article to include the legend for this map source. Sorry for the inconvenience. @nathan thanks for the help!!!! Will you consider including a legend tab within the app itself that would include legend info for any currently loaded maps for easy reference? Edit: Didn't see the comment from a few days ago somewhat above here. Still, would be great to have this feature on a tab similar to the maps tab! Is there a legend available for the Features overlay? 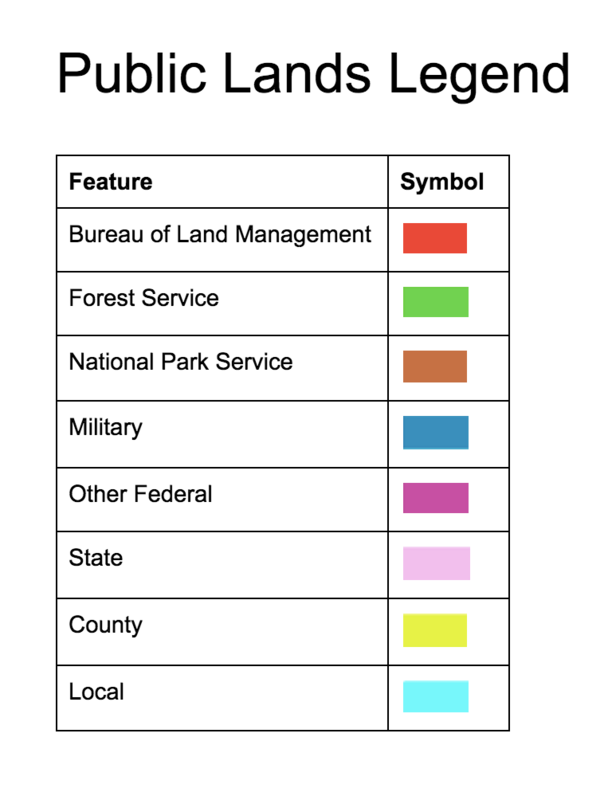 The symbols used in the Features overlays are similar to the USGS legend. If you have a question about a specific symbol, please let me know. I just downloaded this app for the primary purpose of printing maps to practice land nav. Is there a way to set the scale for 1:50000? I want to be able to make my own courses and use the standard protractors. Again, is this possible, if so how? On gaiagps.com, your current zoom level can be found within the URL. While it would be great to have keys/legends integrated into maps (separate tabs, pop-ups, hovers, etc. ), I didn’t even know about this page until I stumbled into it just now. I converted it to PDF and cached a local (iBooks) copy on my iPhone. Beats having to get out a paper map just to read the legend! For the Gaia Topo map, I am curious about what is represented by the line decorations on the trail feature in the map below? There are segments of the trail shaded in a thick purple line and other segments that are decorated with a dashed black and red line. What are they? Thanks! I'm grateful I found this post, as I've been struggling to decipher the meanings of the icons and other graphics on the map. It would be VERY nice to have the key information integrated into the app/map somehow. Maybe I'm just overlooking it, but on my phone and on the web, I don't see any key information. The purple sections of the trail represent steps and the black with red dashes sections are bridges. We are working on surfacing legends and making them accessible from the main map.